Is this what a functional teapot looks like (above)? 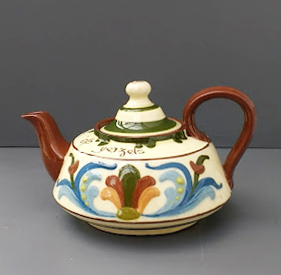 The question was prompted by Keith Savage asking me whether the Torquay ware teapot I wrote about recently (below) poured well or whether it was just decorative. It’s clean inside and I don’t think anyone has ever made tea in it. I’d put it on a shelf and hadn’t thought of using it, but when I read Keith’s comment I tried it. It does pour well. The flat shape makes it stable, the position of the handle gives a good lift and the spout doesn’t drip. It takes half a pint of liquid, two cups. 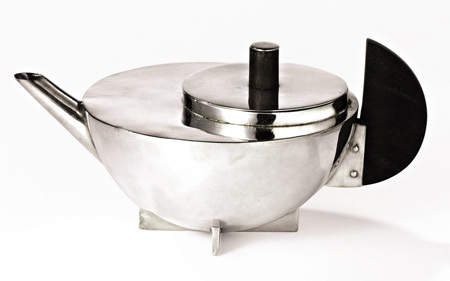 It’s not what you think of as a functional teapot – the word suggests the long-established Brown Betty, or perhaps Marianne Brandt‘s Bauhaus teapot (below), not the ornately decorated Torquay pot made by the Aller Vale pottery. Functional implies that if you design for use, form follows inevitably and there will be little or no ornament. David Pye, late professor of furniture at the RCA, concluded that the idea of function as the quality of an object was incoherent and that a useful object’s appearance, though constrained, was not determined by its intended use. The choice of form is aesthetic and there is no design without style. Pye makes you wonder why you didn’t realise these things before he said them. For example, nearly every ceiling is flat and smooth, but flatness and smoothness are not requirements of of a ceiling, they are aesthetic choices. What came to be understood as functional meant a smooth, streamlined shape or economy and cheapness. The ornate Torquay ware teapot, designed at about the same time as Marianne Brandt’s teapot, works as well as the Brown Betty and I guess it’s a more useful teapot than the Brandt. The Brandt sold for £361,000 at Sothebys New York in 2007. The Torquay pot cost £10 in a charity shop. 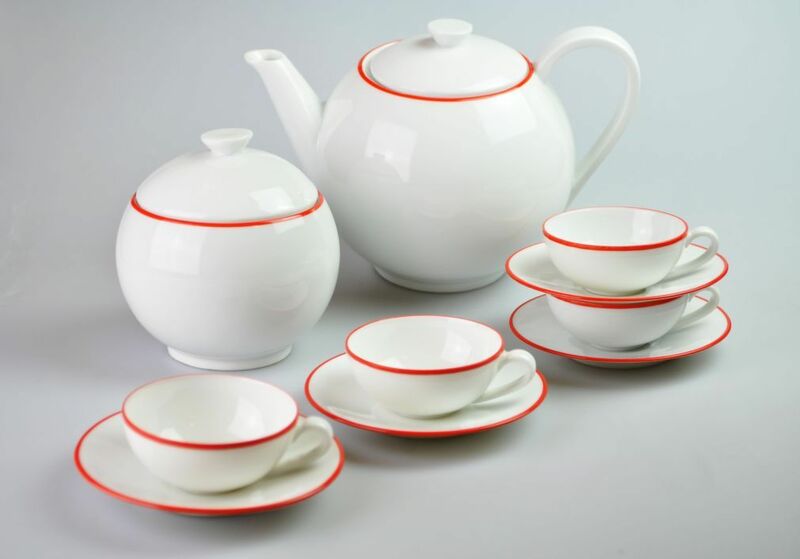 Ladislaw Sutnar’s simple porcelain tea set (above) lacks the ornamentation of the Torquay pot and the aggressive originality of the Brandt. Except for the cups, which are made for an older style of tea drinking, it’s hard to date. It could by Habitat in the 1980s; in fact it was manufactured in Czechoslovakia in 1929-32. It looks as if it works.